I have an interesting project going on with two of my customers. One of them is buying a web-hosting business from the other, and we have to migrate all of the resources (including IP space) from one organization to the other in the same colo. Of course there is a lot involved with this, but one of the things we had to consider was the routing. For the short term (the next few months), the company buying the hosting business (let’s call them BUYER, Inc), will not have its own Internet connection from the colo, but will instead transit through the selling company (we’ll call them SELLER Corp.). Note the interesting thing here: SELLER Corp. has a private AS number. This is really how the topology is, as SELLER Corp has two connections to the same ISP, and only that ISP. And because BUYER Inc. will be doing the same thing, neither company is using a public ASN at this time. This will be important in a moment. The basic idea of the design (both from ISP to SELLER and SELLER to BUYER) is that by using BGP attributes like Local Preference, the entity can ensure that only one link is in use at a time. ISP provides a certain bandwidth guarantee to SELLER, and SELLER is providing a bandwidth guarantee to BUYER. It is much easier to enforce such contracts with a policer if only one link is active at a time, but the second link is waiting in the wings to take over if the primary link has a problem. As BUYER hadn’t yet begun any sort of coordination with the ISP yet, we didn’t know what BGP AS might be assigned to them for a private peering. Hence, we had to come up with our own private BGP AS for the peering between SELLER (AS 64512) and BUYER. I chose AS 65001 for BUYER, for no particular reason. The issue here is that the ISP shouldn’t be accepting any advertisements that include any BGP AS other than the one they assigned to SELLER (64512). So how do we hide the downstream network? Luckily, Cisco’s BGP implementation has a tool for that, the neighbor remove-private-as command. It’s meant for exactly this purpose, to “hide” downstream networks that have private AS numbers and instead substitute the AS (assumed to be a public ASN) of the network sending it on to another eBGP neighbor. The ISP likely uses this same technique at their border with other ISP peers to hide SELLER’s private ASN. The neighbor remove-private-as command removes private AS numbers even if the AS path contains only private AS numbers. There is no likelihood of a 0-length AS path because this command can be applied to eBGP peers only, in which case the AS number of the local router is appended to the AS path. This seems to cover my exact case, and it also makes logical sense that the “remove” function happens on the advertisements prior to sending the update to the eBGP peer (and the moment of sending the update is when the local ASN is appended). But if there is one thing I’ve learned, it’s that when dealing with corner cases it’s best to verify before you assume it works as documented or worse yet, assume how you think it might work. So it’s lab time. Links between routers use the “XY” format, so the link between R1 and R2 is 12.12.12.0/24, and the link from R3 to R4 is 34.34.34.0/24. The routers had stub networks hanging off of them in the X.X.X.0/24 format, so R4’s stub network (representing the “hidden” private network) was 4.4.4.0/24. From a connectivity standpoint this all looks good. But R1 is seeing BUYER’s ASN, 65001, in the path. In the real life scenario, this won’t fly because the ISP sure ought to be filtering out any BGP advertisements from SELLER that have anything other than SELLER’s private ASN of 64512. 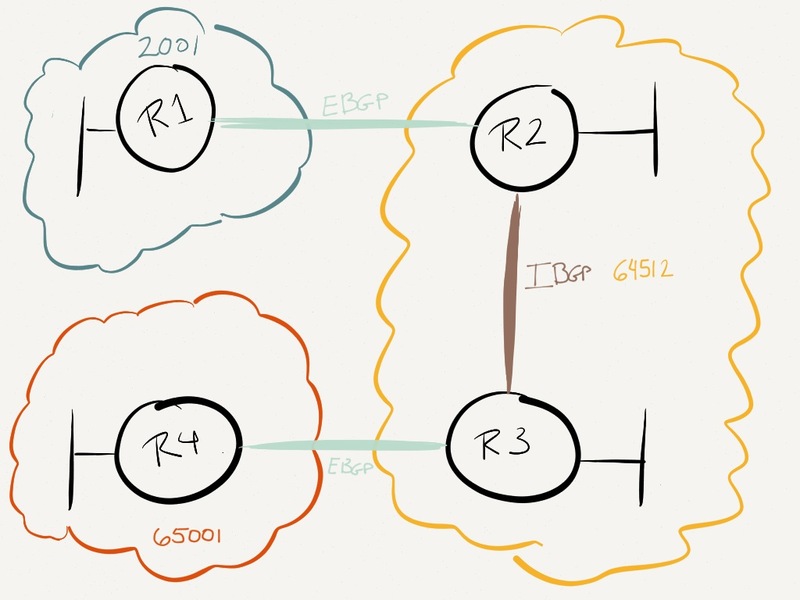 After giving BGP a moment to update, we take another look at R1, and success! R1 (the ISP) no longer sees any evidence of the downstream AS 65001, and yet the networks it is advertising up to SELLER in AS 64512 are reachable from the ISP and anything upstream of it. Read and reread your vendor docs carefully. 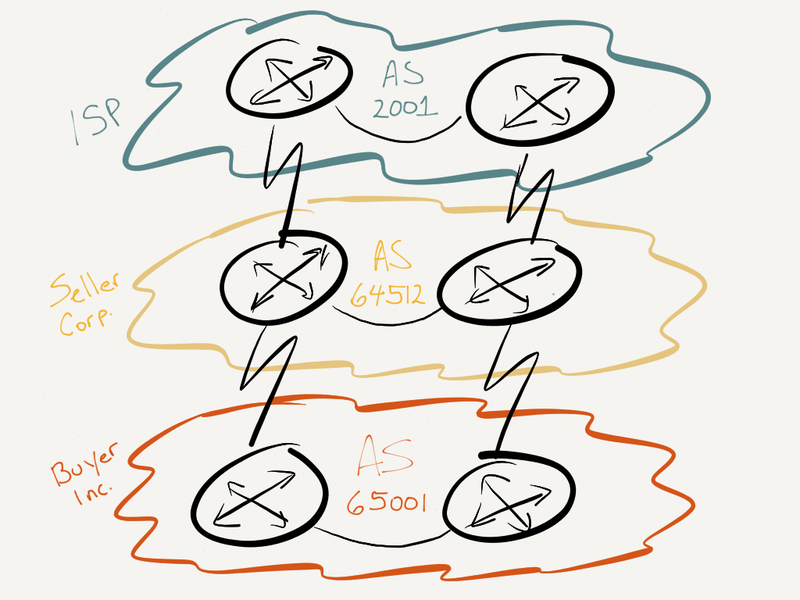 The behavior of this knob can vary between versions – as in the Cisco doc linked – and between vendors. Especially in mixed AS paths. Sometimes only the left-most private AS is removed. In other cases, no AS is removed. Thanks for that caveat! As you point out, the behavior does even differ between IOS versions. All the more reason to do some quick lab validation when using something that appears to be an unusual case.